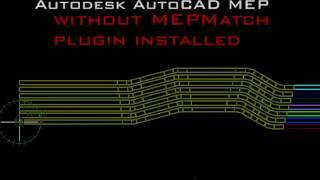 MEPMatch plugin was developed to increase efficiency of modeling and coordinating electrical raceways. This plugin allows to automatically inherit and maintain respective layers for the entire conduit and parallel conduit runs, regardless of system layer keys and current layer assignment. Even parallel conduits continue to be placed according to the layer assignments of the conduits they continue to be drawn from. MEPMatch plugin is a perfect addition for both large and small design and coordination teams. MEPMatch plugin insures continuity and uniformity of work between multiple team members by extracting layer assignments and properties from a working drawing or xReference. It places electrical raceways matching layer assignments extracted from xReferences. By default in Autodesk® AutoCAD® MEP conduits and cable trays are either assigned a default conduit system layer key or current layer depending on Autodesk® AutoCAD® settings. It is a labor intensive and time consuming process. MEPMatch plugin redefines how electrical systems are being created and modified insuring greater process reliability and efficiency. It has innate ability to insure uniformity of project CAD standard, simplify design and coordination review and maintains construction document fidelity. It allows to maintain and increase the level of detail assigned to electrical raceway as your project evolves. It's a proficient tool and friendly use, no more match properties when I extend my conduits!!! MEP Match plugin is a gem. It drastically improved our AutoCAD MEP workflow and saved us a ton of time. Not to mention it helped us with design consistency and accuracy of our models and final drawings. Excellent app ... makes electrical modeling efficient and mitigates mistakes.